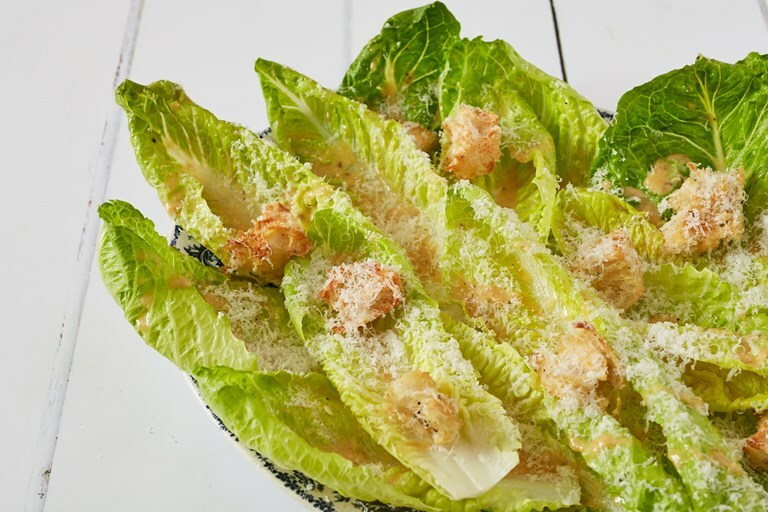 A modern-day classic, Caesar salad is beloved thanks to its crunchy texture and zingy, umami-rich dressing. Making your own from scratch is far better than buying a ready-made dressing and will showcase exactly why this salad is so popular. See Anna's other lettuce recipes here. This is my favourite salad of all time. It has been ruined by awful pre-packaged takeaway versions, with stale croutons, cardboard Parmesan flakes and browning lettuce leaves. Or else by restaurants jazzing the salad up, as if it ever needed ornamenting… Dreadful. I had one of my best culinary moments eating a Caesar salad at the Zuni Café in San Francisco – it was one of the most perfect plates of food I’ve ever eaten. So simple, so balanced and so delicious. The recipe given below is from The Zuni Café Cookbook, slightly adapted to my preferences. It is worth reading the original recipe just to see the level of precise detail that she gives in preparing this salad. One thing that is stressed is that the dressing must be fresh so do not make it in advance; at Zuni Café, they famously make it to order.